`They're Not Pets, Susan,' says a stern father who has just shot a bumblebee, its wings sparkling in the evening sunlight; a lone office worker, less than an inch high, looks out over the river in his lunch break, `Dreaming of Packing it all In'; and a tiny couple share a `Last Kiss' against the soft neon lights of the city at midnight. 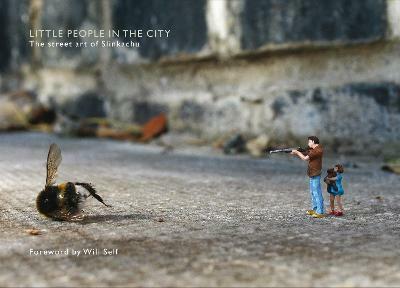 Mixing sharp humour with a delicious edge of melancholy, Little People in the City brings together the collected photographs of Slinkachu, a street-artist who for several years has been leaving little hand-painted people in the bustling city to fend for themselves, waiting to be discovered. . .
Illustrations note w. col. photos.